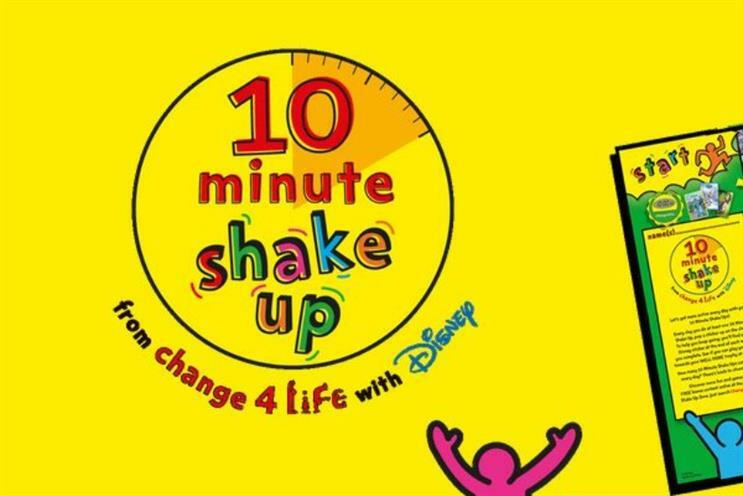 Change4Life and Disney have teamed up in a new campaign that encourages children to exercise every day. The campaign, called the '10 Minute Shake Up' aims to get children doing as many 10 minute bursts of activity as they can a day. It will run until the end of the summer holidays. Activities will be based around four Disney stories: Big Hero 6; Frozen; Monsters and Toy Story. Disney will create content including articles and animations for schools, print, TV and online media in support of the campaign. Ricky Wilson, the lead sing of Kaiser Chiefs and judge on The Voice, is supporting the campaign by producing his own 10 minute shake up. The workout will be beamed across schools in England today, to enable teachers to take part in an interactive PE lesson. It is the second time the public body has partnered with Disney. Last year it ran the same campaign, gaining 292,823 signatories to the scheme. The campaign coincides with research that shows exercise has social benefits and a positive impact on children’s social skills and self-esteem, confidence and peer acceptance. Parents can sign up for a free pack, which will include a Disney themed team wristband with timer, activity cards and a team poster.